It’s been quite a year for the newly branded Entrust Datacard. The merger of the two companies was announced about a year ago, with the new company and brand being revealed at the 2014 CARTES conference. The company followed that up by also announcing an extension of a partnership with Interpol and two new product announcements. Datacard has been in the transaction processing business for many years and the vast majority of payment cards end up being touched by the company in some way, Rockvham says. Entrust’s focus on identity enables the combined company to bring a different perspective to the market. From issuing payment cards to enrolling citizens into electronic identification programs, the new company can meet the need. Entrust Datacard also announced the signing of a new five-year partner agreement with INTERPOL. The relationship, which dates back to June 2009, builds on a history of using one credential to cross borders and access secure systems. The INTERPOL eID and ePassport is used to cross borders and access secure INTEPOL systems. To date, more than 95 member countries are acknowledging and accepting the credential at border checkpoints. At the core of this technology, Entrust Datacard provides the PKI, trust infrastructure and authentication solutions to make the credentialing project possible. This operational infrastructure helps support the issuance of ICAO and EU standards-compliant INTERPOL ePassport and eID under the INTERPOL Travel Document initiative. This also includes advanced Extended Access Control-enabled document validation. “Agents get called and might need to be in a different country in 24 hours and they don’t have time to wait for visas and let criminals get away,” says Rockvham. In April 2015, Entrust Datacard and INTERPOL will take part in INTERPOL World, participating on an expert panel focusing on advanced solutions for border management and security. Entrust Datacard customers are moving away from desktop and laptop computers and using tablets and other mobile devices as their primary devices, says Lindsay Kent, vice president marketing of software at Entrust Datacard. The challenge is offering the same type of security on these devices that companies could with computers. “People want to do everything on the tablet that they could on the computer, including accessing enterprise systems outside the firewall,” Kent says. To make the mobile device just as secure as any other system, Entrust Datacard has released the Mobile Smart Credential. These mobile-based identities may be issued, managed, derived and authenticated via the on-premise Entrust IdentityGuard software authentication platform or Entrust IdentityGuard Cloud Services. Using mobile-derived credentials, identities may also be originated from users’ existing vetted smart card or digital IDs. Users would download an app and then teach it where to find the identities, Kent says. They can de derived form existing smart card credentials or loaded over the air. When the solution is deployed, a trusted user or employee owns a digital identity that has endured a vetting process. Enterprises and governments alike may extend their security investment by recreating this digital identity — via the Entrust IdentityGuard software authentication platform — to derive a trusted identity on secured mobile devices. The Entrust Datacard solution complies with government standards, and the solution may be deployed locally at the customer’s premises or via Entrust IdentityGuard Cloud Services, which is secured in the same facility as the existing U.S. Federal Shared Service Provider certification authority. 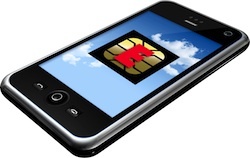 For U.S. government agencies, managing the surge of BYOD demands is particularly challenging. Government agencies must follow and comply with many policies — including FIPS 201 — that shape how employees and IT organizations conduct day-to-day business. The Entrust mobile approach can eliminate the need for government agencies to build custom solutions that comply with various regulations and policy. This further extends the Entrust Datacard investment in the U.S. government space. From FIPS 201 PIV credentials to advanced mobile identity solutions that conform to NIST SP 800-157, Entrust Datacard leads the way in security technology that meets rigorous U.S. government standards. To increase effectiveness for different use cases and environments, Entrust Datacard has partnered with Thursby. Integration with the Thursby PKardPro Reader application — available for both Apple iOS and Google Android — creates an authorized digital identity on a user’s mobile device. This empowers customers to perform secure browser transactions on mobile devices while increasing usability and decreasing costs. Finally, Entrust Datacard released a new product that enables organizations to issue smart cards using a cloud-based system, Kent says. “Organizations don’t want to set up these servers and buy thousands of licenses that they won’t use,” he explains. Enterprises just need a card printer, smart cards — and can otherwise go to a web page — figure out what data and certificates need to be loaded and then print the cards. The new solution enables organizations to produce and manage an identity credential for each person associated with an enterprise, government agency or citizen population — all delivered as a service. The cloud-based management console is leveraged to enroll identities, activate credentials via over-the-air enrollment, and handle day-to-day management. Onsite printing and encoding of credentials is integrated with the cloud credential management system.